The ACT's economy, despite its small population is estimated to have a Gross State Product (GSP) of $37.5 in 2016-17. In this period our economy grew the fastest in Australia (4.6%), with the second highest GSP per capita. The strength of the ACT economy rests upon its highly educated workforce and the high value services they provide. Canberra is well placed to respond to global economic changes such as rapidly changing technologies and increasing importance and value of the 'knowledge economy' and the growth of the shared economy. Our increasingly diverse population provides opportunities for creative and innovative services well placed to take advantage of Australia's evolving economy. This rich human capital will help us respond to a rapidly changing economic times. In a global economy increasingly characterised by competition between cities, an innovative and increasingly diverse city such as Canberra is best placed to attract and retain sought-after workers. While Canberra is already strong with its administrative and professional service industries, we need to boost our competitiveness in continuing to develop our knowledge based research and development and information technology industries. Land-use planning can do much to build prosperity for Canberrans. As a human economy, fostering productivity, liveability and sustainability will attract and retain the ACT's important resource — its people. 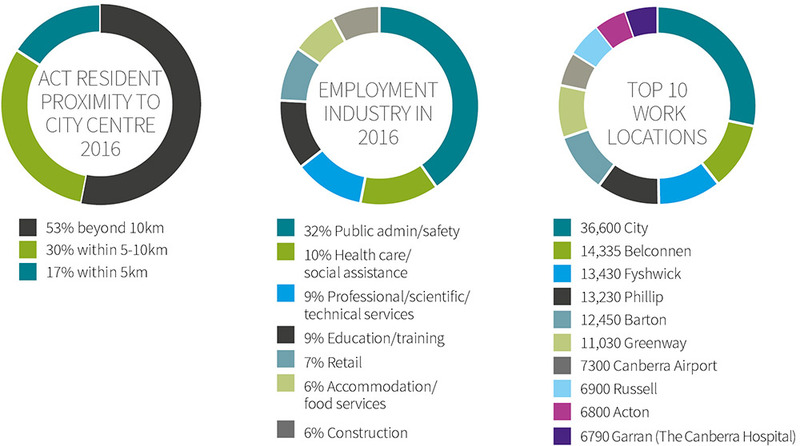 The ACT's economy continues to diversify with new businesses and jobs being created in a host of knowledge and service sectors. At the same time, the public service and defence industry continues to provide a solid base for our local economy. Using land-use planning to directly support the continued diversification of our economic base makes the ACT more robust by reducing our reliance on public administration service as the major source of employment. Economic diversification is a virtue in itself, as the growth of commercial services and knowledge-based industries support the agglomeration of a number of activities in which their economic value together is greater than the sum of its parts. 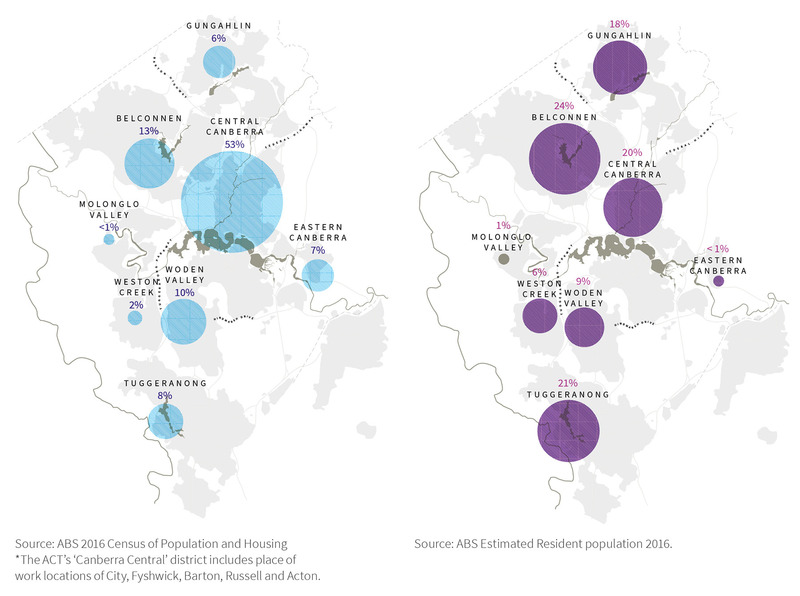 The greater part of the ACT's economy and jobs is based in central and eastern Canberra, with our population dispersed throughout the north, west and south of Canberra (see maps 4 and 5). The challenge for this Strategy is to better integrate land use and transport in order to lead to a more sustainable, accessible and equitable city. Map 4: ACT districts employment distribution 2016; Map 5: Population breakdown by district 2016. Click to view larger version.